Now in its 6th year, RecFest continues to break all records and, for 2019, goes FULL ON FESTIVAL! RecFest19 will bring together a massive 3,000 Talent Acquisition professionals from all over the world for the definitive destination of the industry's leaders. With dedicated topical zones, over 70 world-class speakers from all over the globe gracing the 5 stages, fun event activities, marquees, street food, multiple bars, relaxed meeting points, and several chill-out areas, RecFest19 will offer a truly unique experience for everyone lucky enough to secure a ticket. And that's before the DJ and live music kicks in at 5pm! 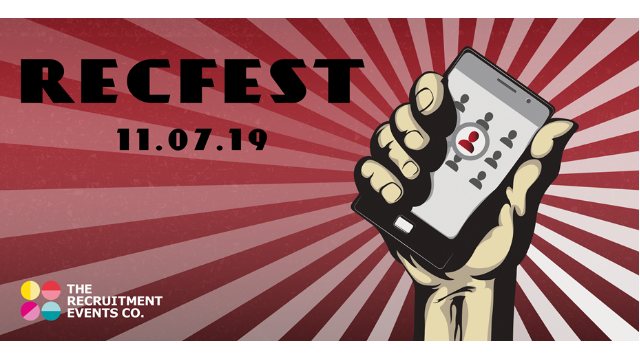 If you’re looking to celebrate what’s next in recruitment and are keen to bring your TA team together to bond, team-build, and network with their industry peers, RecFest definitely has something special for you! Stay ahead of the curve, and make sure you're part of RecFest19.